The the facts about using hidden cameras and listening devices. Michigan law makes it a felony for any person, whether present or not during a “private conversation,” to willfully use any device to “eavesdrop” upon the conversation without the consent of all parties. To eavesdrop is to overhear, record, amplify or transmit any part of the private discourse of others without permission. It is also illegal to knowingly aid, employ or procure another person to eavesdrop and to use or divulge any information that one knows, or reasonably should know, was obtained in violation of the statute. Punishment is up to two years in a state prison, a fine of not more than $2,000 or both. Listening to a telephone conversation on an extension phone without the consent of all parties has been held to be eavesdropping under the Michigan statute. Because Michigan’s definition of “eavesdrop” is to “overhear, record, amplify or transmit any part of the private discourse of others”, Michigan courts have held that participant recording (even without the consent of the other parties) is not prohibited. Therefore, a party to the conversation can record the conversation himself without obtaining the consent of the other parties. He cannot, however, employ a third party to record the conversation on his behalf without getting the consent of all the parties. This issue was central to the Michigan appeals court’s holding in a 1997 civil suit involving the media. In Dickerson v. Raphael, the court ruled that the “Sally Jessy Raphael” show violated the eavesdropping statute by recording a discussion between Dorothy Dickerson and members of her family in a public park. Dickerson’s daughter contacted the “Sally Jessy Raphael” show, with the intent of confronting her mother about her involvement with Scientology and taping the confrontation for later broadcast on the show. The producer of the show arranged to have the daughter “wired” for the conversation, and the conversation was monitored and recorded from a nearby sound truck. The court ruled that the conversation was private, even though it took place in a public park, because: 1) it was intended only for a small group of people (i.e., the family members present) to hear, 2) no passers-by had been close enough to have heard it, and 3) the daughter and the producers knew that Dickerson would not have consented had they asked for her permission to tape the conversation. The court ruled that, although the daughter may have been within her rights to record the conversation herself, the involvement of third parties violated the statute. Multimedia, Inc., the company that produced the “Sally Jessy Raphael” show, violated the statute by employing technicians to eavesdrop and by divulging the conversation on the broadcast. The court held that Sally Jessy Raphael, the show’s host, also violated the statute because she was ultimately responsible for the show’s content and, therefore, for divulging the conversation. The court also rejected the defendants’ First Amendment arguments, saying that although the First Amendment protects the publication of truthful information of legitimate public concern, the information may not be obtained unlawfully. The court held that the eavesdropping statutes are generally applicable laws that had only an incidental effect on the defendants’ newsgathering and reporting. It is a felony in Michigan to possess a device designed or commonly used for eavesdropping with the intent to unlawfully use it or allow it to be used for eavesdropping. Punishment is up to two years in a state prison, a fine of not more than $2,000 or both. 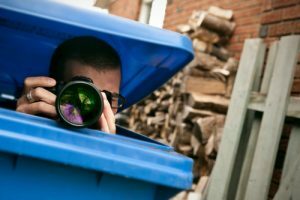 Any person who trespasses on property owned or under the control of any other person in order to subject that person to eavesdropping or surveillance (defined as secretly observing the activities of another person for the purpose of spying upon and invading the privacy of the person observed) is guilty of a misdemeanor. Another Michigan statute makes it a misdemeanor to “willfully and maliciously” tap or make a connection with a telephone or telegraph line to read, copy, or make unauthorized use of any message or to aid or conspire with another person to do the same. Punishment is imprisonment for up to two years or a fine of up to $1,000. Thinking of using hidden cameras? Know the facts about hidden cameras. Any person who installs in any private place, without the consent of the person(s) entitled to privacy there, any device for observing, photographing, or eavesdropping on the sounds or events in such place or who uses any such unauthorized installation is guilty of a felony punishable by up to two years in a state prison, a fine of not more than $2,000 or both. The fact that such a device has been installed will be regarded as sufficient evidence of the intent to use it for unauthorized observation, photographing or eavesdropping. A “private place” is a place where a person may reasonably expect to be safe from casual or hostile intrusion or surveillance but does not include a place to which the public or substantial group of the public has access. In a 1981 case, the Michigan appeals court held that a toilet stall in a public restroom at a roller skating rink is a “private place” under the statute. The court affirmed the conviction of a man who installed “two-way” mirrors in the women’s restroom of his roller skating rink. The court later allowed a civil suit against him for invasion of privacy to go forward, even though there was no proof he had actually observed the plaintiff through the mirror. Any party to a conversation upon which eavesdropping is practiced may sue and obtain an injunction against further eavesdropping. The plaintiff may also recover actual damages and punitive damages as determined by the court or jury. Michigan Statutes Annotated Sections 28.807(1) through 28.807(9), 28.808 (Callaghan 1997); People v. Abate, 306 N.W.2d 476 (Mich. Ct. App. 1981); Dickerson v. Raphael, 564 N.W.2d 85 (Mich. Ct. App. 1997); Sullivan v Gray, 324 N.W.2d 58 (Mich. Ct. App. 1982); Navarra v. Bache Halsey Stuart Shields Inc., 510 F. Supp. 831 (E.D. Mich. 1981); Harkey v. Abate, 346 N.W.2d 74 (Mich. Ct. App. 1983).